I was running a private course Saturday to Tuesday, with some exceptional sea conditions, and great company!! Looking forward to seeing you both for our next adventure in July!! ...with the bonus of a terrific sunset!! Adventure Club members Rachel and Chris are training for the Devises to Westminster Canoe Race this Easter. They will be using a carbon SKUK Triton, working as a pair to complete the gruelling 125 miles (plus 77 portages) non-stop! Both paddlers are raising money for the charitable trust Twincess, supporting parents of those with Down Syndrome, and changing perceptions of others to the condition. "Twincess is place where families of those with Down’s Syndrome can connect, share, support and celebrate!" This morning's sea kayak training was from Peel, Fenella Beach, in bright sunshine. Members of the Adventure Club will be travelling over to support Chris and Rachel on their DW challenge! So great to have blue skies, beaming sunshine and great company on the water!! The Guillemots & Razorbills have started arriving on the sea cliff ledges, and Eider Ducks were dotted about along the route. Cookie modelling the new Adventure Club t-shirt, when you renew your membership. This evening's night paddle set out from Fenella Beach Peel, on the West coast of the Isle of Man. The main breakwater was a hive of activity, with scallop dredgers landing their catch. Really enjoyable, thanks folks, see you on Sunday. 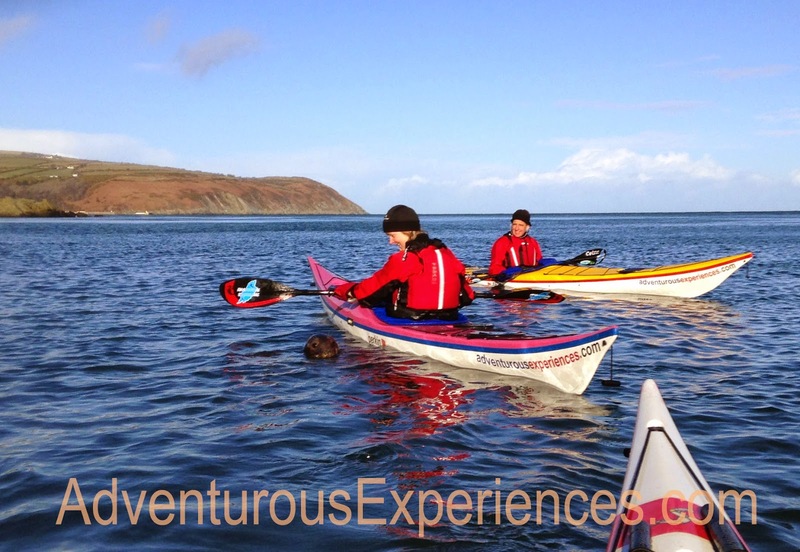 Stunning day on the water Sea Kayaking from Port St Mary, on the south coast of the Isle of Man. ... an inquisitive one nosing the toggle on the kayak. The afternoon sea kayak trip was for newcomers, as well as Lauren and Janet joining us for the hot sunshine! Caves were lit up, sea was calm... pretty nice! After a break we headed back around Sugarloaf Rock, very peaceful today, but soon to be inundated by Guillemots and Razorbills for their nesting season. Youth Scholarship - TR 3.